Turn refunds into revenue, apply the automated return system to scale up sales. Thank customers for shopping in your store with credit and build their loyalty. Refund requests make a pain point for merchants. About 20% of customers return the purchased good, and during the after-holiday period, the return rate spikes to 30%. After the shoppers get refunds for spontaneous purchases, they float to your competitors to buy products alike. Win your customers by refunding their purchases with store credit. Let them use store credits to make new purchases at your Magento 2 shop, or to pay taxes or shipping costs. Apply store credits to make up for some unpleasant shopping experience and restore customer satisfaction. Improve sales by giving credits in your "store currency"
Grant store credits to motivate your customers to shop in your store. You can add custom credit amount from the admin panel. Enable customers to pay for products with store credit in full or partially. Allow them use the credit to cover taxes and shipping costs. Use it with One Step Checkout to timely remind your customers of one more payment option and ensure a seamless process. Let your customers control their Store Credit. Provide transparent Current balance and History tabs on their account page. Notify your customers about changes in their Magento 2 credit balance automatically via an e-mail subscription and let them stop notifications. Cover Magento 2 refund requests with store credit either partially or in full to improve the shopping experience for your customers. 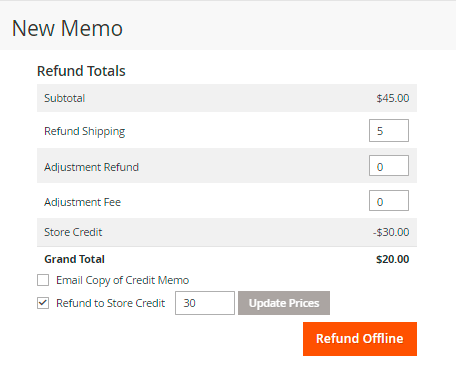 Refund to store credit creating a credit memo. The amount will be fetched automatically and then you can correct it if needed. In case the customer used store credit together with money to pay, you’ll return the sum of money in store credits while the credit used for the order isn’t restored. Use Magento 2 Store Credit & Refund extension to add/deduce Store Credit in one click. Access Balance History of any customer to make swift changes. Track changes your admins made in Action column. Prevent wrongful deductions and leave comments. 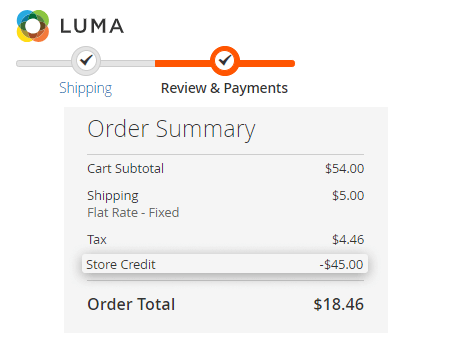 Use a customer’s store credit to pay for their orders directly in the backend. Pay in full if the balance covers the order price. If the price is greater than the store credit, deduce the credit and inform the customer about the amount they still have to pay. Also, cancel the payment if needed. A customer may address your online support to ask for some clarification on product characteristics. In case a customer is satisfied with the present offer, a manager can immediately place an order. In so doing, the manager will also manage to charge store credit off from the balance once the customer doesn’t mind. In case the customer thinks the price is too high, the manager can still retain them offering some credits for immediate purchase and thus reducing the price. Speed up the whole shopping process and significantly enhance customer satisfaction with Magento 2 One Step Checkout extension. Employ Magento 2 Loyalty Program extension to create a unique scheme to reward regular customers with exclusive discounts. Use flexible shopping cart rules to generate targeted offers and boost sales. Here all works in accord: customers have many rights, but we, the owners, still stay protected and make profit.. And reward possibilities are very big - I only tried thanking with store credits but it attracted my 5 new customers to shop. Small profit et, but it’s only been a week. The extension is cool, it’s easy to set up and manage. But ‘pay in the backend’ functionality has 1 issue. Admins don’t always leave comments on what they do Would be nice to make this commenting obligatory and to ban other actions without explanations. Is it possible?